Tasty and delicious, full of healthy ingredients, and the bonus: Weight loss. Losing 10 lbs. in 4 months – while feeling great and knowing it’s good for my heart and health – I’m a fan of the Mediterranean diet. Though I’ve been preparing Mediterranean dishes quite often (I collect Mediterranean cookbooks!) for several years now for the taste, health benefits, and the fun of cooking this style of food, I decided that in order to get serious about weight loss, I would incorporate it on daily basis – creating a diet that would work for me – and I’m delighted with the result! What are the major themes of a Mediterranean diet? Calcium from yogurt, feta, parmesan, and other cheeses. (And some milk). Fabulous assortments of herbs and spices, such as ginger, turmeric, cumin, cinnamon, cardamom, coriander, cloves, fennel, nutmeg, marjoram, basil, lemon, mint, etc. So, what does Kim’s mostly-Mediterranean Diet look like? 1 free-range egg sautéed in olive oil, 1/3 cup spinach, and 1/2 spelt English muffin with a dash of butter and honey. 1/2 medium, or one small, banana. A smoothie with a combination of a few fruits and veggies such as: peaches, mango, melon, pineapple, blueberries, raspberries, banana, avocado, cucumber, plus 1/2 cup Greek yogurt, splash of organic milk, freshly-grated ginger, cinnamon, tablespoon of finely ground flaxseed; add chopped almonds/pecans or muesli sprinkled on top. 1-2 cups of hot water (plain or with ginger and/or lemon in it). 1 cup of a high-quality tea. (For calorie cut-back, I drink it black; though occasionally reverting to my British roots, I enjoy a cup of tea with milk). Coffee (black, when dieting; white, when maintaining). Cappuccino / latté on weekends. 2 squares of dark chocolate or a biscotti (with a second cup of coffee). A pot of jasmine pearl tea, 1 tablespoon of honey swirled in the pot. Muhammara spread (roasted Red Pepper, Walnuts, Pomegranate juice) – delish! Sardinian Parchment Crackers – from Trader Joe’s / WholeFoods – how did I ever survive without them? 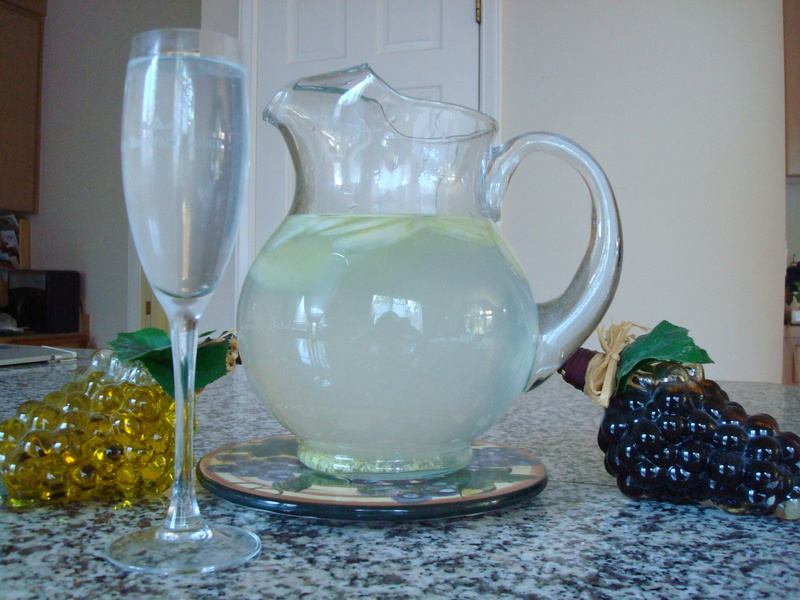 Drink: Juice mixed with sparkling mineral water, or glass of cucumber/ginger water. Cup of Rooibos tea (this time with milk) and a couple of dates, figs, chocolate-covered walnuts, ginger biscotti, or some kind of after- lunch treat. Melon, Mangoes, Apple, or other fruit or healthy snack (no more than 100-150 calories). Drink: Glass of water and/or decaf tea/coffee. 4 oz serving of Fish, Chicken, Lamb, or Beef, with various vegetables, perhaps a Ratatouille or similar use of Eggplant and Tomatoes or other veggies, and small serving of rice pilaf or pasta, or grated cauliflower, with flavorful herbs and spices. An example might be: Lamb Ravioli, Moroccan Chicken with Saffron, Fennel or Rice Pilaf (I have my Persian friend, Zinat, to thank for the introduction of aromatic, anise-flavored, ground fennel spice in rice – fabulous! ), Grilled Chicken/Hot Hummus Salad in Pita, or other similar Med-style dishes. Lamb and Greek Lentil soup, or another meat/vegetable/legume soup. 1/2 Olive Bread Roll or crackers. 1/2 small Feta and Spinach pizza or 1/4 of a 12-inch homemade Chicken pizza with a variety of Mediterranean veggies on top. Super thin crisp organic flour or gluten-free crust, light on the cheese, olive oil and slow-roasted tomatoes as a base – perfecto! Serving of Greek yogurt with fruit and a drizzle of honey, or another healthy dessert, with a cup of Rooibos tea with milk. 1/2 spelt English muffin with butter/honey, or small bowl of cereal with dash of milk. That’s it and I’m off to bed, happy and satiated at about 1000-1200 calories per day. Note: obviously this works for me, but you may need more calories depending on your stature and needs. I also take some important vitamins to make sure I’m getting all needed nutrients. BTW, I keep an eye on my daily calories in an easy little app on my Android phone (Simple Calorie Count). You might think this takes a bit of discipline to stay on this type of diet for several months – but it’s SO easy and delicious that I’m not inclined to stray from it too much. It took a few weeks before I saw any change, then – ‘wham’ the pounds started falling off. Now I have the next ten pounds in my sights, a dream I had all but given up on! The wonderful thing about the smells and flavors of the Mediterranean diet – it’s as if you’re exploring the villages of Tuscany, the markets of Jerusalem, or the shores of Sardinia, without leaving home. So, if you want to lose a few pounds and maintain a healthy diet, while enjoying great taste, may I recommend the Mediterranean diet? And hey, after you lose your desired weight, why not celebrate with a latté and teeny chocolate éclair? Cheers, my friends. I raise my sparkling water glass to you and hope you’re enjoying the blessings of a bountiful harvest yourself. We have much to thank God for!